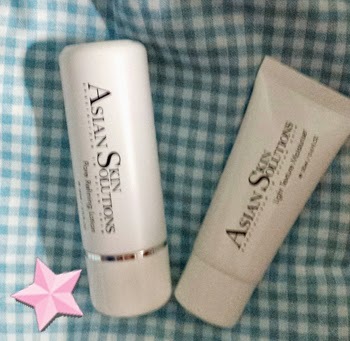 Today I'll be doing a review on Asian Skin Solution's Skin treatment! 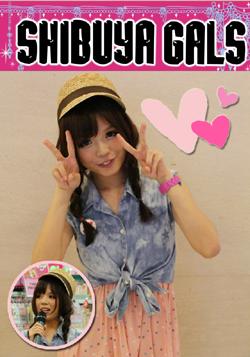 YEAH~! 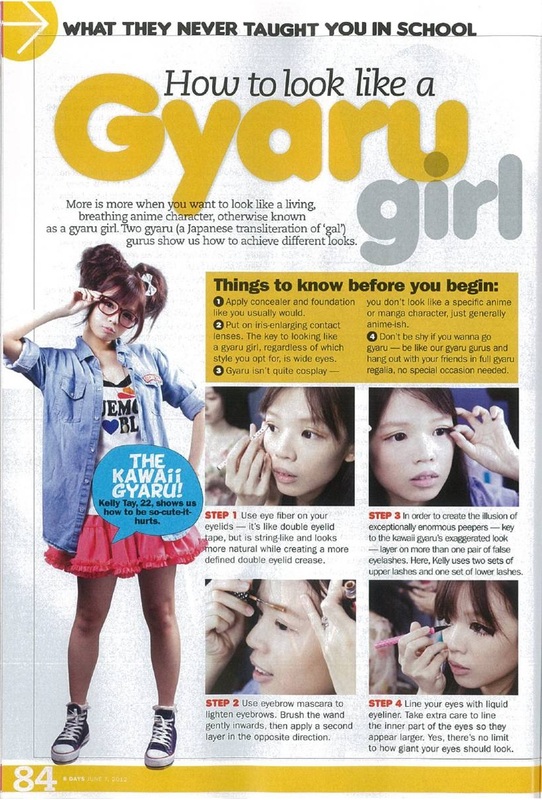 Working hard towards flawless skin! According to my consultation at Asian Skin Solutions, it's said that Asians are sensitive, dehydrated and more prone to acnes!! I'm SENSITIVE YET SUPER DEHYDRATED!! 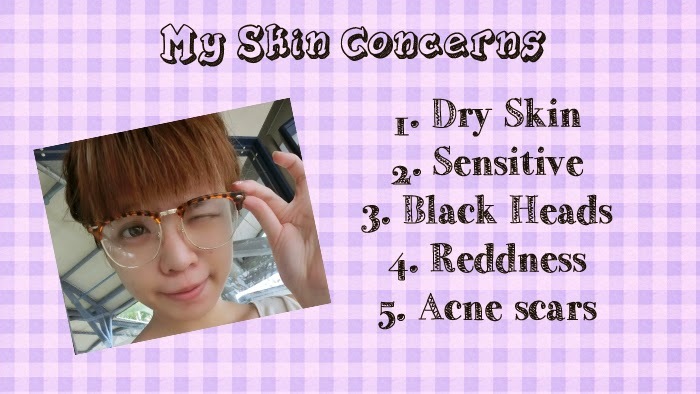 Which means, even if i want to put a lot of lotion and moisturisers on my face, i still have to worry about my sensitive skin issues all the time! 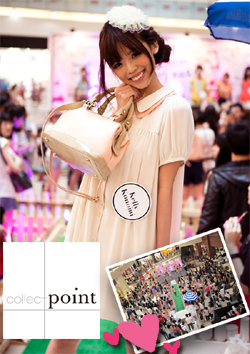 But i'm glad to hear that Asian Skin Solutions (like the name suggests) targets all the troubles of asian skin! All their products are water based (great for sensitive skin) and provides ample hydration to the skin! Asian Skin Solutions, specializes in Asian Skin, and targets common skin problems faced by Asians, such as acne, pigmentation and large pores. They can effectively solve any Asian skin problem for both males and females! So, let's begin the consultation! 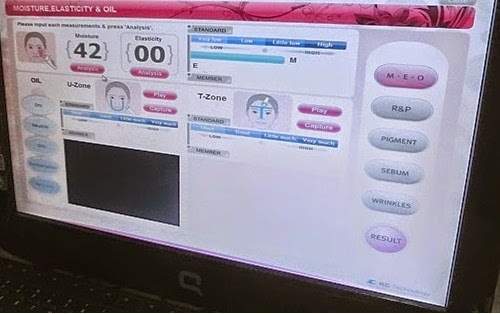 They uses high technology to measure different aspects of your skin! Although LOW, i've already developed some fine wrinkles around my eyes! Need to put more eye cream!! After these series of tests, i'm super worried about how my skin will look in a few years time! 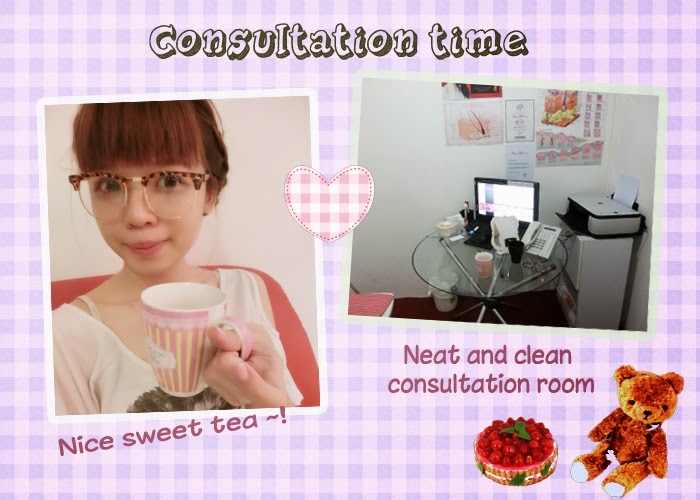 Fortunately, my specialist gave me many good advices to follow through for better skin! Not only that, she also customised my facial treatments to cater to my needs! Then after the consultation, we headed for our treatment session! 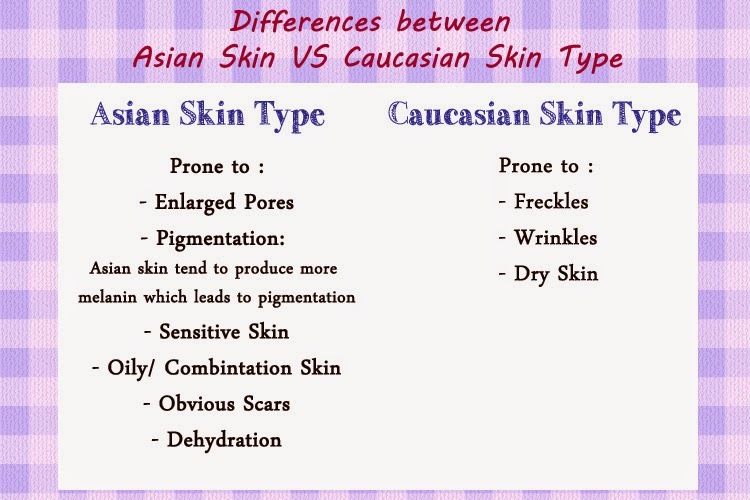 What is unique about Asian Skin Solution’s customized treatments is that all skin treatments are targeted to help in repairing of skin condition and not only fight against skin problem, but to promote healthy cell growth within for longer and lasting healthy skin! 2. Aqua-moisture mask with softening essence treatment: To soften hard-to-rid stubborn and clogged pores for better absorption of nutrients and deep-cleansing of pores. It's really gentle! I had painful extraction before, those that will leave you tearing and fear for your next visit! However, this time round I can still comfortably chat with my beautician haha. Gentle pressure point massage to relax your stiff shoulders and further drift you to lalaland. 7. Collagen+ Double-Action Treatment Mask : This treatment mask locks in 2 key components for your skin – Cucumber and collagen. Cucumber extracts helps to calm the redness and sensitive skin while providing hydration for the suppleness in the skin. Collagen aids in repairing damaged skin, helping to heal the acne faster, lighten scars and pigmentation, and not forgetting the anti-ageing properties to reduce visible fine lines! The mask is thick and moist (but not sticky) that you feel like all the mositure is absorbing into your skin! Also the cooling sensation of the cucumber mask helps to reduce reddness. 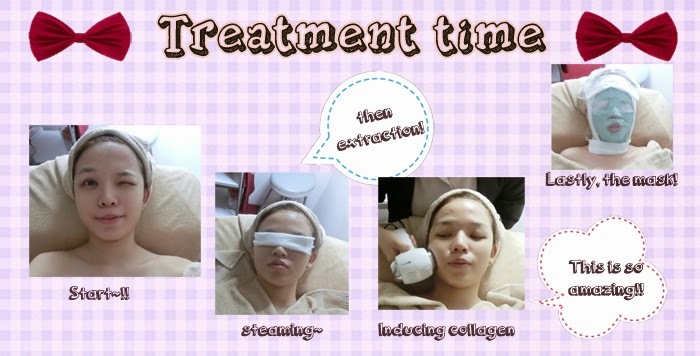 I emphasized that the Collagen + Essence repair treatment is super amazing!! I did my LEFT side! Can you tell all the difference i've noticed? I WANT TO HAVE THAT TREATMENT EVERY DAY!! then i'll have smaller and more lifted face! My blackhead are cleared (No more strawberry nose!) and my skin feels moisturised even after long hours of bus ride sitting directly under the air conditioner! Most importantly, skin feels so youthful and smooth! They also given me some skin products to use! The nemesis of enlarged pores, Asian Skin Solution’s pore refining lotion contains natural Vitamin B5 and Green Tea extracts to minimize and refine enlarged pores without traumatizing or stripping your skin of its moisture. This lotion is absorbed quickly by your skin and leaving a slight tinge of refreshing smell to let you feel invigorated! This lightweight moisturiser is so refreshing and finely textured it gets absorbed quickly into the skin for maximum hydration at all times! Specially formulated for dull and sensitive skin, add some natural radiance and vitality back to your skin! And yes, they are water based as well! It absorbs into the skin really fast! I've been using them for a week! 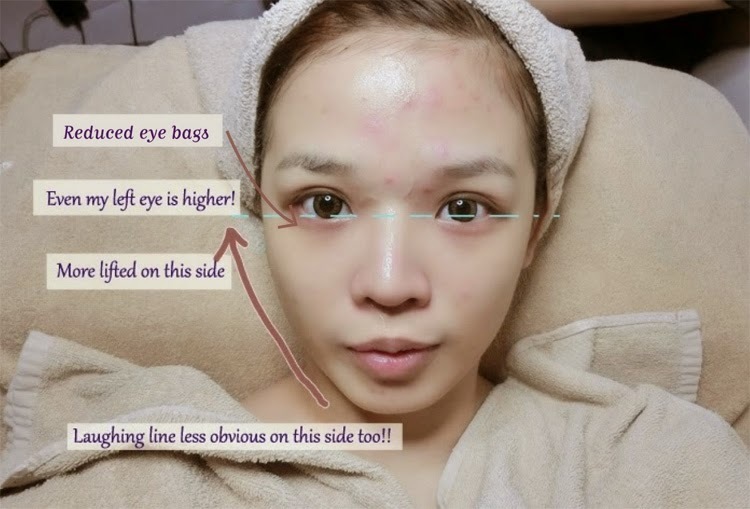 Improve your skin condition today – simply answer a question correctly to enjoy the new Collagen+ Skin Treatment + Eye Revival Treatment (worth $248) absolutely FREE! All these only for the first 20 readers! Don't be hesitant, try it to feel the difference yourself! NICE,UR SKIN LOOKS SO SHINNY....CAN U GIVE ME UR SECRET?